Profile: Landmine likes to see himself as a sort of robotic Indiana Jones (he's seen all the films several times! ), braving all manner of dangers to uncover minerals or relics. His fellow Autobots just see him as a hothead, albeit a hard-working one. The trouble is, Landmine sometimes sees his job as a bit on the boring and unglamorous side. He's very good at what he does but yearns for something more. Landmine loves adventure stories, be they literary, celluloid, or video, and wants very much to live out his fantasies. That he's an Autobot warrior, waging an epic war against the evil Decepticons (an adventure by anyone's standards), doesn't seem to be enough. He fears others think he's as old and dusty as some of the artifacts he unearths. Nevertheless, once he's given a job to do, all Landmine's concerned with is getting it done right! Optimus Prime appreciates such dependability and wishes he could convince Landmine that he fulfills an important and necessary role in the Autobot war effort. 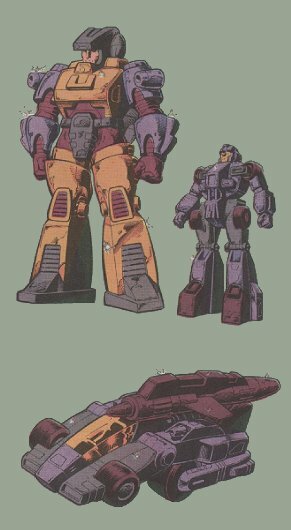 The minerals he brings back are used as alternative power sources, fueling machinery, weapons... and Transformers. Still, thinks Landmine, it would be nice to rescue the odd maiden and battle the odd dragon! Abilities: Because of the hostile environments Landmine often has to work in, exposed to cosmic gales, meteorite rain and the like, his shell is constructed of a high-density Cybertronic alloy, resistant to all but the most severe conditions. The suit has full life-support systems to assist motor functions in high gravity. Because of its construction, the shell is impervious to most armaments. Outside his shell, Landmine transforms into an all-terrain exploration vehicle, his mining activities facilitated by electromagnetic, sonic-thermal, chemical, and radiation scanners. He is armed with a laser saber and an astro-blaster that shoots bursts of incendiary explosives. Weaknesses: Landmine tends to rely too heavily on his outer Pretender shell, becoming almost reluctant to leave the safety of it. In battle, Landmine often over-commits himself, anxious to prove to his fellow Autobots he's just as rough, tough and interesting as any of them.